We have a full-time case worker on staff to assist clients with any services not directly provided by the Mission. They also help people deal with the stresses of life and provide a friendly shoulder to cry on while gently introducing the Gospel of Jesus Christ and praying for their needs, if desired. Our case worker is a more experienced and trained volunteer in the community who has had some experience in listening and helping the people who use our services. 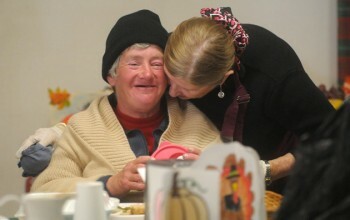 They have caring hearts, are filled with mercy and grace and are aware of other community resources our guests may need. Confront guests with their sinful and self-defeating thoughts and/or actions, and help them find a new or renewed willingness to live in accordance with biblical teaching. We also have a licensed Christian councilor on call, provide referrals to local counseling agencies and we occasionally have student intern councilors in the WNMU Masters program available. Share the post "Case Worker"